WebDAV backup presumes utilizing a WebDAV data transferring protocol either as data source or as a destination, or for both sides (i.e. for WebDAV sync data). To use this technique, Handy Backup provides a WebDAV client plug-in that allows backup to WebDAV in either direction. Handy Backup allows WebDAV backup in all editions through the dedicated "WebDAV" sync plug-in governed by a simple, modern-looking graphical interface (GUI). The new task wizard allows two modes: simple for basic backup settings and advanced for full-featured WebDAV sync or backup. 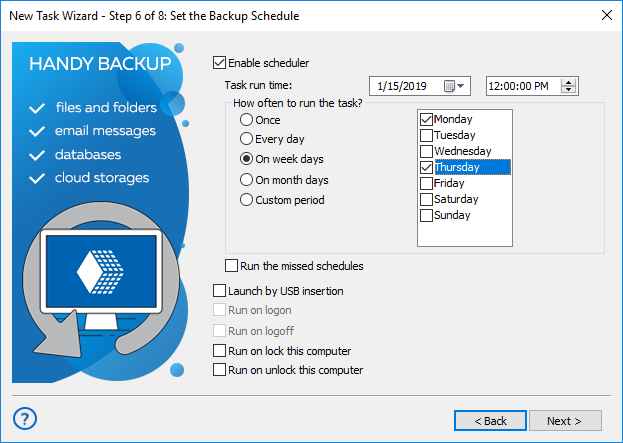 You can schedule any WebDAV backup or sync task in Handy Backup, to start it at an exact time with an exact repeating interval that can last from a single minute to some months. In addition, advanced task wizard mode allows you triggering backup to WebDAV cloud or from it by some system event. Besides a secure WebDAV data transferring protocol, you can always compress and/or encrypt your WebDAV backup data with an internal tool, and decrypt your archives during recovery. Note that Handy Backup keeps unencrypted backup files in native format, allowing using these files without recovery! The technology of WebDAV backup and sync allows connecting to many clouds. For some of these clouds (Dropbox, Box, OneDrive etc.) Handy Backup has own plug-ins requiring no WebDAV client software. 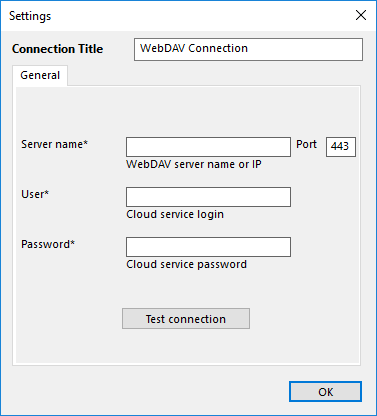 Still, many other private and public clouds need for WebDAV to connect. For example, you can organize backup to some private OwnCloud server by using WebDAV. Another case is some popular service that has no plug-in in Handy Backup but supports WebDAV. Examples include not only cloud services but such cases as Wordpress backup. At last, WebDAV HTTPS or HTTP protocol is just an extension beyond HTTP, and you can use WebDAV client software to access many Web resources (e.g., for downloading and uploading files during website backup or CMS management). The Professional solution allows WebDAV backup and recovery for almost any user-level data exists. Excellent backup software for IT pros, experts and advanced users! 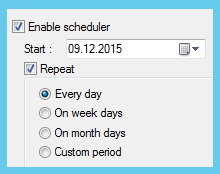 Create a new task by clicking "Create" on the management panel or by Ctrl+N keys. Select "Backup" on Step 1. Here, do not mark "Use Advanced Wizard" to continue work in simple mode. Click "Next". On Step 2, expand the "Cloud" group and click on "WebDAV" here. Click "Create a connection…". 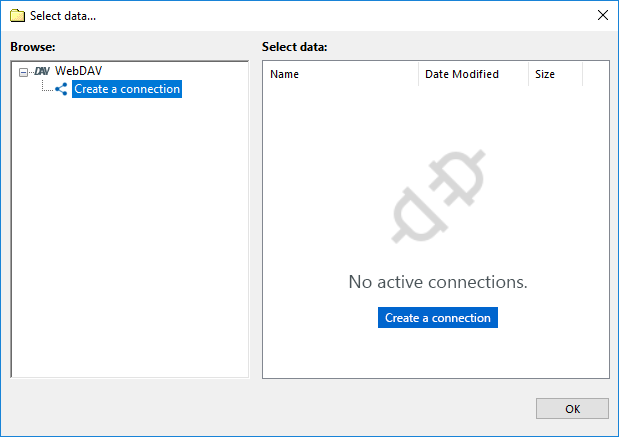 You will see a WebDAV server connection dialog. Fill all fields to connect to your particular WebDAV server. Name this particular connection in the Connection title field. Click OK and return to Step 2 window. Here, select a connection name. In the "Select data…" dialog, mark a checkbox against name of each data that you plan to back up. Click OK and then "Next" to proceed. On Step 3, click on an appropriate data storage service that you plan to use for backups. The left panel shows a list of available storage plug-ins. 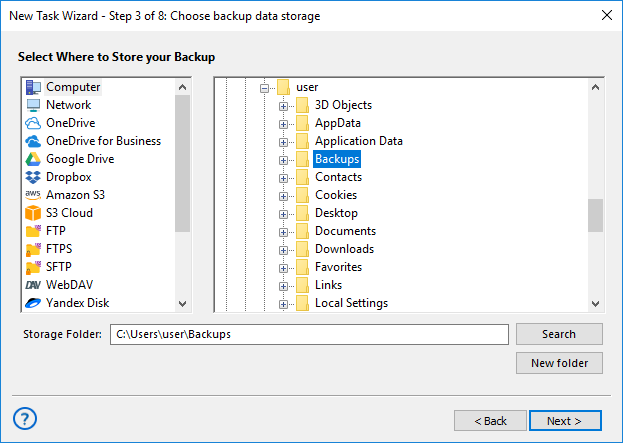 In a storage selection dialog, choose a folder where you will store backups. Click "Next". Compress and/or encrypt your WebDAV backup data if you want on Step 4. Schedule your task on Step 5. Now go to the final Step 6 by clicking "Next". Here you can give a name for your task and see all the task parameters. Click "Finish" to exit from a task wizard. Your task will start immediately if you select an appropriate option on Step 6. Otherwise, you can run it manually or wait until scheduled time. 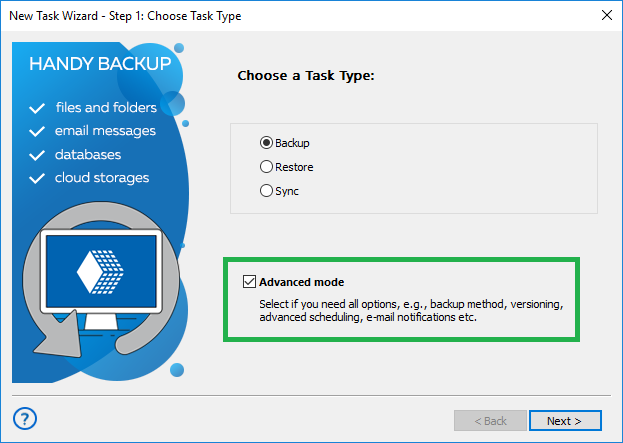 Using the "Advanced Mode" in the task creation wizard, you have an access to many extra options for WebDAV backup, such as partial (incremental, differential or mixed) backup, storing versions, time stamping, calling external programs before or after a task and triggering tasks by system events. Currently, there are a huge number of WebDAV storages. 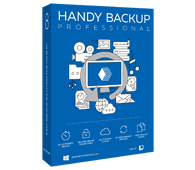 Handy Backup also provides a lot of opportunities of backing up: supports all kinds of physical, virtual, and cloud environment. WebDAV sync and backup with Handy Backup software is a simple and convenient task! Try it by downloading a free trial version for 30 days!